The movie goes on like nothing unusual happened. From the second row we are some of the last to leave. A crowd has gathered in the lobby watching two young women who have Eruch backed into a corner: “We have to go there now, we have to dig Him up, He’s alive, He’s alive.” It’s the same two who were crying so much at the Sufi center the day Baba died. Eruch was saying, “No, please. The doctor attended. There was no life in the body.” The girls aren’t buying it: “Let’s go check to make sure, He is alive.” The crowd of two or three dozen are all facing Eruch, they don’t look satisfied. Eruch had been so enthusiastic that morning to show us how they handled Baba’s passing. Having Him come back to life on the big screen really threw Eruch a curve. I felt embarrassed for everyone and left. I only have one witness who remembers all this as clearly as I do, longtime Sufi, Richard Cormier. A lot of other folks who were there don’t remember a thing about it; some have only a vague recollection. There must be others in the 200+ who remember. I hope they leave a record too. That film went back to the cutting room and subsequent groups never saw the part showing Baba’s resurrection. Hopefully there is 35 feet of amazing film sitting safe somewhere. It’s hard to imagine they could have destroyed something of Baba that beautiful. I understand why they suppressed it. Eruch looked miserable backed against that wall. 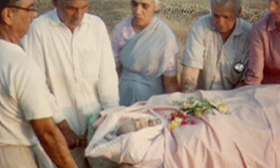 He couldn’t let people think Baba had chosen complete fools for disciples and had gotten Himself buried alive. Last month I heard a story about Mani. Every day after Baba died she tried to get in the Tomb by herself. Finally she managed it, and sitting there alone with Him, she says He came to life and opened His eyes. Hopefully, someone who heard this from Mani will document it, if for no other reason than it’s true. I love the fact that Baba demonstrated on film His mastery over death and His cool, calm willingness to pass into another “state,” a state He obviously prefers to our human state. May we all go straight to Him, when our turn comes. Jai Baba.